Welcome to February´s edition of Click. While going through the latest gallery I happened upon Diane´s page . First, I am so doing a page like this! Second, I love the grid those squares make. So today let´s talk about a few creative ways to get griddy with your photos! I browsed Pinterest and found the photo above. They had used a big cardboard box to take each photo and then added everyone together to form this collage. I think it is a very clever and fun way, isn´t it! But if you are like me and won´t be buying a TV or something else big enough to come in a huge box, here is another way! The different pocket page protectors that comes with a Project Life style makes it easy to do this. Like what Elise Blaha Cripe did here. Just take portrait photos up against a white background, be a little creative with where you look and then when you insert the photos. I made a different version. I used an app on my iPhone called Pocketbooth to take photobooth photos. This makes an instant grid. Here is how I used them on my layout! I love that we are so goofy together! Oh, and that #love card is by our Francine that is making one journaling card each day of February and share them all as downloads on her blog! I also wanted to share a great blog post from Paislee Press. They shared how you can take photobooth-like photos with your regular camera, and make it cute! 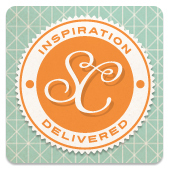 Creature Comforts - simply GORGEOUS inspiration boards - a great source for colors & patterns. Pantone - since I work in cosmetics manufacturing, I always have a Pantone book by my side. The Pantone site is a great resource for color trend & color combinations! Wander - Such awesome typography & graphic treatments! TYPEInspire - Want more typography mojo? Typeinspire is a great source for clever use of design and type. Tartelette - my first love when it comes to food photography. Simply divine! Where do YOU find inspiration on the web? These were super easy to make. I started by choosing three of my favorite fonts (Dock 11, Pacifico, and LD This and That), typed three words, and added a numbered list with blank lines. After that I dug into my stash to find reading-themed patterned papers. I changed the colors of the words to match the patterned papers and printed the lists out on white cardstock. I added a 1.75" wide strip of patterned paper at the top of each list and a .75" wide strip of patterned paper at the bottom. Done! I already know I'll have to make each of my kids a second list (and, hopefully, a third! ), but that will be easy as I've saved my template. Read to your kids. Have your kids read to you. Take pictures while you do this (or have someone else take pictures) and use them on a scrapbook page. Write stories, or get your kids to write stories, and then read your stories to each other. (If your kids aren't old enough to write, write for them and then have them illustrate their stories.) Create a no-photo layout using one of your stories in place of a photo. If you haven't already done so, check to see whether your local library offers a summer reading program. If they do, sign up! While you're at it, check to see if there are any special summer events. I bet there are! (Even if they only have summer reading programs for kids, no one says you can't play along as well, even if you're not eligible for prizes!) While you're at it, check with your local independent bookstore(s) to see whether they offer a summer reading program and/or any summer events. Take pictures while you are there and signing up and make a layout about it, or, better yet, a mini-album including a page for each book read across the summer. Read these two blog posts I've written across the last few months in which I recommend books for children: Cool Books for Kids, Round One and Cool Books for Kids, Round Two. Use reading as travel. Pick a country you've never been to (or a state, province, region, etc.) and look for a book that provides an overview of that country and a cookbook with recipes from that country. Travel by reading, looking at pictures, and cooking and eating. To round out your experience, see if you can find a work of fiction set there as well and/or a book designed to teach basic phrases in the language spoken there. You could even make a flyer, or have your kids make a flyer, to announce/advertise your "trip." Take pictures of your "trip" and make a layout or a mini-album about it. Don't get hung up on fiction. There's so much more out there! Pick up a biography, a colorful encyclopedia with great illustrations, a how-to book, an atlas, etc. Tie reading to family movie night. Pick a book that's been made into a movie and have everyone read the book before watching the movie. Vote on whether the book or movie is better. Complain about how they are different.Take pictures of everyone reading the book and watching the movie and create a layout about the experience. Don't forget to include the voting results and/or a list of complaints! Stop before reading the last chapter or the ending of a book. Write your own ending. Read the actual ending and compare it with your version. If you have time, write your own sequel. Take pictures of the writing process and make a layout with a pocket to hold your ending or your sequel. Whatever you do with books, papercrafting, or books and papercrafting this summer, have fun! Welcome to Scrapbook! Saturday. Are you glad to be back to the land of scrapbooking? Thank you, again for spending your week with me! This week, we are loaded with goodies. A sketch by Donna, a design challenge, and a printable! Scrapbook Saturdays are the best! Donna has created a sketch for us based upon her layout in the gallery. Here it is. And for those who prefer, we have again created a layered digital template for you to download and enjoy! You may download it here. Did you notice how many layouts this month contained lists? Whether randomly scattered, listed in a column, placed inside a design element, or created with visual cues, there are many ways to write out a list of items. This month, especially, lists seem appropriate and helpful. A couple of music things for your pages. Enjoy! I changed it up a little, squaring off the tipped photos, and switching up their sizes a bit. I tried to leave the photos askew but I just couldn't! Lists. Such an efficient way to journal. Here is my layout using one of the elements from the printable. Thanks for stopping by!! Before you go, I wanted to let you know about some fun things going on at reneepearson.com. First, this weekend they are running a contest to win a seat in Molly Newman's new class. Here's the skinny. Follow @reneenews and tweet about the contest. The contest ends this Sunday. They’ll announce the winners on Monday, February 20th. Next, there are two new classes open for registration. Please take a minute to stop by and visit Renee's site to see the class descriptions and details! We hope you enjoy the sketch and printable; please remember they are for personal use only! That's it! Three more challenges to help get your ideas moving and those pages finished! Have a great week! I'll be back next week! Today on my last day of blog hosting, I thought I would share a few ideas for Guerilla Love. What is that you ask? Well, let´s just say it is a very fun way of spreading love and goodness around you. I have followed Patience Salgado on her blog kindnessgirl.com for a while now and I love how she gives example after example of how kindness changes everything. Her latest mission was to suprise the garbage collectors with a thank you note. I have been known to do a little Guerilla love myself :) It is simple really: leave a note in a library book, put a heart on a mirror or chalk up a sidewalk. Before Christmas I made these small envelopes and made them really pretty. Inside I tucked a little encouragment message for whomever would find it. I found some awesome free printables at a blog called Kind over Matter there are a couple of downloads that are cards you just cut out and you can use them in Guerilla loving! Go check them out! Another place I have found lots of ideas is Color me Katie . For example she painted hearts on rocks and placed them in the cracks of a pavement "I made sure to fill some cracks in the sidewalk with the rocks for people who feel so low they just can't look up." How sweet is that?!! Sherri from the blog Families are Fun! made this simple craft with her kids and had them put up the magnetic smiley caps to share smiles around town. I could go on forever! And don´t forget to include your children, it is such fun thing to do together! I will leave you with this sweet video from Patience with a great project to do on Tuesday (Valentine´s Day! Thank you all for a LOVEly week! CHA Armchair Attendee Week: Write. Click. Scrapbook. Team Members' "Must Haves"
Welcome to the last day of CHA Armchair Attendee Week! I hope you've enjoyed our week this week - I had a lot of fun checking out all of the sneak peeks, pics and video from the CHA show floor, and sorting through all of that to find the key trends I shared earlier this week. For today's post, I (Vivian) asked Write. Click. Scrapbook. team members to tell me what their top "must have" is from this set of CHA releases. The only parameter I set was that they had to choose a product from a manufacturer whose design team they are not on. Some team members had an easy time doing this and were able to instantly name a favorite. Others took some time to think it over. Some of us had a really hard time and listed more than one product since our top "must have" was, in fact, a tie amongst several "must haves." Some are still thinking about it. Some lines were pretty popular amongst the team, as you will see below. Feel free to share your "must haves" in the comments below - we want to know what's caught your eye, particularly if we've missed seeing it! I hope you've enjoyed CHA Armchair Attendee Week here at Write. Click. Scrapbook. this week! I don't know about the rest of you, but I can't wait until some of this new product hits stores! Vivian here, welcoming you to Part III of the CHA trends report. Today we're going to take a closer look at trends in the types of products offered. (If you missed Monday's and Tuesday's posts, Monday's focus was on pattern and motif trends, and Tuesday's focus was on theme trends.) A reminder that I'm not aiming to be comprehensive in these posts; instead, I've chosen to comment on a few big trends to give you a taste of what's being released at this show. Today I'm going to focus on just two trends. Our first product trend is one that I thought had already reached its apex, but I have clearly been proven wrong. Banners, flags, pennants, and garlands are everywhere! As I've done the last two days, I am going to share with you where I'm seeing the unique takes on this popular trend. On to the second trend for today: washi tape. Wow. There's a lot of it out there. A lot. I could go on and on here, as there's lots more washi tape out there, but hopefully the images above give you a good sense of the variety of tape that's being released at this show. What do you think of these product trends? What other product trends are you noticing? Leave a comment and let us know. Be sure to check back tomorrow for our weekly give.away.day. I'll be back with you on Friday to share write. click. scrapbook. team members' "must haves" from the CHA show. Welcome to CHA Armchair Attendee Week! Getting on with our introduction…some of you may be wondering what it means to be an “armchair attendee.” How can you “attend” the show if you’re not there? Well, here’s my process. In the weeks ahead of the show, I regularly frequent websites that compile manufacturers’ sneak peeks. Most manufacturers “sneak” their new releases prior to the show via their company’s blog/website, Facebook, Twitter, etc. and that can be exhausting to follow without the aid of websites that do the work of compiling sneaks for you. Three good websites for this are Scrapbook & Cards Today, Scrapbook Update and The Scrap Review. Each presents the sneaks a little bit differently: Scrapbook & Cards Today provides clickable links by manufacturer, Scrapbook Update provides a clickable list by date of sneaks, and The Scrap Review blogs sneaks as they appear. As I look at sneaks, I make sure to check out both official product images as well as any projects showcasing the new products. Often a line or a product that doesn’t grab me at first looks different when I see it on a layout or a card. Once the show starts, I watch online for photos and videos from the CHA show floor. Not all companies do sneak peeks or extensive sneak peeks and seeing new products together with projects made with them in the booth can inspire. You can try searching #CHAshow on Twitter, check magazines' and manufacturers' Twitter feeds/Facebook pages/blogs, or follow targeted CHA forums (like the CHA Winter 2012 forum at Two Peas in a Bucket or Studio Calico's CHA forum). Now let’s take a look at trends in patterns and motifs. I am not going to attempt to be comprehensive here, but have selected three trends that have caught my eye and will share those with you. Beware, lots of images forthcoming! The first trend I want to share with you is chevron. Chevron patterns started appearing recently in scrapbook products, but they have really taken off with this show. While chevron up until now has been primarily a single color chevron stripe paired with a neutral, this time around it seems to be “chevron with a twist.” Let me show you some examples. How cool is this quilted chevron from Pink Paislee's Prairie Hill line? When I first saw this sneak I had to stare at it for a bit to figure out all that was going on here! Let's move on to look at another trend: clouds. I don't know about you, but cloud patterns just make me happy. I'm seeing a lot of patterned clouds this year. This fun paper from GCD Studios' Oh Happy Day line features chevron clouds. One more pattern/motif trend that is popping up all over the place: honeycomb/hexagon. I could continue commenting on pattern/motif trends and pasting examples here for days, but hopefully this will give you a taste of what's out there and coming to stores soon.We'd love to hear from our readers - which of these three trends is your favorite? What other patterns and motifs are you seeing across sneaks? Stay tuned for tomorrow's Trends, Part II, which will focus on product line themes seen across companies.